Discover our top 5 2019 best UK Android casino, with UKGC licence. Check out our full list of Android casinos with more tips and answers to popular questions! Here’s our TOP 5 Android casinos which are licensed and regulated by the UK Gambling Commission. Take note of exclusive deals and approved sites with the FeedBACK’s Choice badge for an elevated experience! Unlock mobile-only payment methods like direct carrier billing such as Boku. Tip: Use our custom-made casino comparison tool to stack all important casino facts and figures and help you pick just the right one. What Casino Games Can You Play on Android? It’s been long since game developers started to embrace the mobile-first mindset, so you can rest assured all new casino games are compatible with smartphones and tablets, including Android OS. Depending where you’re from, you’ll have a chance to play hundreds of mobile-friendly video slots and table games from renowned iGaming studios like IGT, WMS, Playtech, NetEnt, Greentube, Microgaming and Yggdrasil, as well as Big Time Gaming, NYX and Play’n GO. Some of our favourite Android online casinos also offer exclusive games and live casino tables, as well as hot tournaments with impressive prize pools that you won’t find anywhere else. So, to start playing for real money, you first need to create a casino account. How to Register at an Online Casino on Android? To begin with, we recommend you play at one of our hot picks above. Hit that “Go to casino” button and click “Register” or “Sign up” on the casino website to create a new account. The process usually takes a matter of minutes, however you may also be asked to confirm your email or mobile number via SMS code, which is common practice. To avoid delays when cashing out, consider sending the operator all the necessary Know Your Customer (KYC) documents. In some jurisdictions like the UK, these must be provided within 72 hours! How to Deposit at an Android Casino? Making a casino deposit on your Android device is no different than any other smartphone. In addition to players’ feedback and the operator’s reputation in general, we make sure that all our top Android casinos are safe and secure by verifying that they have SSL encryption and are fully licensed and regulated by some of the best iGaming authorities like the UK Gambling Commission and the Malta Gaming Authority. With that in mind, here are some popular mobile payment methods. Some of the most popular casino banking options that you can choose from include PayPal, Skrill, Neteller, Visa, Mastercard and paysafecard. The select few operators will also let you use a direct carrier billing service like Boku, to make it even more effortless to top up your account from the palm of your hand. Just remember that the payment method you choose for deposit must always, when available, be also used for withdrawal. Your deposit should hit your account usually within minutes. But before you do that, why not take advantage of the welcome bonuses! As a new player, consider using a welcome bonus to get more bang for your buck on signup or the first deposit. They usually come as match bonuses or free/extra spins, but sometimes you’ll also find cash back, raffle tickets and other goodies. All casino bonuses offered on the desktop site should also work on Android phones and tablets, but sometimes they’ll also throw in additional incentives that are exclusive to mobile players. Before claiming any offers, always read the full T&C and don’t hesitate to contact the customer support for further assistance or send us a message. Keep in mind that winnings can come in the form of bonus money, which must be played according to the bonus policy, or real money. You can also use the fun play mode to try almost all of the casino games without any risk as a guest visitor. We all know that gambling can be addictive and that emotions can sometimes take over. To help you retain that control, many of our favourite UK Android casinos have specifically designed responsible gambling features, including an option to set your bet and deposit limits. Some of the bigger brands out there, like Mr Green, have technology that can predict and prevent gambling beyond personal limits. Use them to your advantage! keyboard_tab Can I get bonuses at an online casino on my Android device? Yes. Don’t forget to enter a bonus code to activate it on registration or your first deposit! keyboard_tab Can I also play on an Android tablet? Yes, but you may not get access to the Android app. keyboard_tab Can I use the same mobile account to play on desktop? Yes. In fact, you can have only one account per casino. keyboard_tab Is it safe to play at an Android casino online? Yes, as long as you play at recommended and approved casinos like the ones listed on this page. This is completely optional and made for your convenience rather than necessity. Scan it to quickly go to the mobile site or directly to the Google Play Store. keyboard_tab Do I need to download a casino app to play on my phone or tablet? No, as long as the casino also offers mobile-friendly instant-play website. Play almost anywhere, any time. Some games are heavy and can have an impact on your monthly cellular allowance. 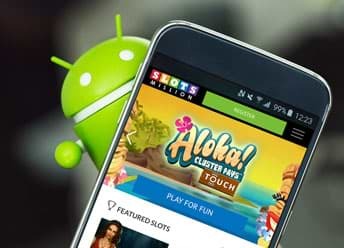 If you can live with the few limitations and find yourself using an Android phone or tablet for the most part of the day, then you should definitely consider one of our top-rated Android casinos that have stood the test of time and live up to high expectations. What do you think? — Take a moment to share your thoughts with a rating in our full Android casino reviews and see what your fellow players have said about them for further discussion.